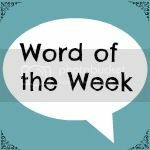 Share the post "Word of the Week 6/2/15"
Hello and welcome to Word of the Week! How is it already Friday? And February? Time is flying by! I do enjoy pausing and thinking back over my week, and looking for an overriding theme, helps me to slow the time down. And I thank those of you that take the time to do the same and then link up with me here. It’s a pleasure to have you all. So yes, it’s been cold! You know that, I guess? Well, it’s had a bearing on my week as it seems to have affected us. At the weekend, we went down to my brother’s in Bewdley. Lovely place, but oh so cold by the river. And where did my brother propose we luncheon? Oh yes, outside at one of the riverside pubs! There were patio heaters on, but it’d be fair to say that I still felt the cold! I haven’t run in it. How useless am I? Just started running and now the freezing weather is putting me off it. I was berating myself to my mum and she told me you’re not supposed to exercise in freezing conditions as it could kill you. Well, I’ll be taking that advice and hiding behind it as an excuse then! My hands always crack in the cold weather. I think the cold and the combination of washing them many times a day makes them very dry. I’m used to it, and used to them bleeding, but unfortunately, my poor little Boo came home with bleeding knuckles the other day which of course upset her. We’re getting through some hand cream here! It makes me a bit grumpy, too. I think it’s the biting wind that we encounter on our morning school run that then puts me off venturing out in the day with Little Man. And I know we always feel better when we get out into the fresh air, but we’ve hibernated a bit this week, just popping in and out on school runs (oh, and to collect my mum from A&E, but that’s a whole other story!). He’s been very happy, as we’ve painted and crafted and played and read, but I’m itching to get out. I think a weekend family outing is needed, so I’ll get onto that! Oh, and to round it off, the Husband and I woke up yesterday with colds. Hooray! Goodlcuk with the running when the weather sorts it’s self out. Their poor little hands. What hand cream do you use? Hopefully a bug free weekend ahead…? Roll on some warmer weather!! Mommy’s Little Princesses recently posted…Word of the week #5 – LAST! My hands crack when it’s cold too, although so far I’ve been lucky… touch wood! I have found Nivea Hand SOS Intensive Balm to be very very good. It isn’t cheap – or I don’t think it is! but it is good and a little goes a long way. I also wear gloves whenever I go out no matter how long I’m out for. It’s definitely been chilly this week, we haven’t seen much snow at all here in Suffolk though! I don’t mind the snow if we can stay in and snuggle but otherwise it can just be a pain! I feel your pain!! Myself and Bella are suffering with crackec hands and we ve all had varying degrees of colds and bugs this week so i ve pretty much been housebound as well! It s actually supposed to be Spring over here in Ireland now but the weather doesn t seem to be agreeing! Hope we all warm up and get better soon! Can relate to what you are saying 100%. I hate the cold! I am sat here at the moment with my dressing gown and a duvet on despite having the heating set to 20! I hate the cold! It always puts me in such a grumpy mood!! More than anything I felt this word this morning! I thought that I am the only person with such dry hands. My hands bleeds as well and I cant stop washing it the whole day! My son had got dry skin too and this really makes me look forward to spring. Your word definitely describes this last week!. I get chapped hands when it’s cold, i’m currently plastering them in E45 Repair Cream, I can’t wait for the Summer months!. We all have colds here too, well it started off as colds and I got sinusitis! Not nice!! I totally agree that it feels too cold to go out without a very good reason at the minute, I am usually a winter person as I love the snow, but for some reason this year I have had enough of the cold, maybe it is the fact that Boo has been ill on and off since October but I really can’t wait for the sping!! Right with you with the hands but (touch wood) not with the colds. Oh no 🙁 I hope you and hubby recover quickly, and Boo’s knuckles to too, and I hope your mum is doing ok? What a week! Definitely not running weather either. I hope this week is kinder to you all. I hate the cold, I have a problem a bit like your one with your hands only its my face that gets ultra dry and sore and no amount of moisturiser ever seems to help …soooo annoying! I can relate. It’s been cold here too, and I heard someone say Feb 6 or 7 is usually the coldest day each year. I can’t stand ot be cold indoors, but outdoors it’s been nice. Markus recently posted…Recipes even a dad like me can do! Oh dear, sounds the right word, though! it has been painfully cold!!! We had to put the girls back in the car it was so bad when we went out at the weekend! Sorry I’ve been a bit rubbish commenting on #wotw this week – sorry!!!! Oh I feel for you; just the thought of sitting by a river eating al fresco makes me grab forward blanket!! It has been very cold, the wind chill in particular has been cutting here, so I don’t blame you for staying in doors. I just hope your cold gets better and you guys warm up enough to venture outside for some fresh air! Hi Jocelyn, I’ve seen on the news that you’ve been having a cold time of it over there. A pub lunch sounds such a nice way to spend a lazy lunch time, but outside?…In the freezing cold…No way! I have recently found myself running less and blaming it on the weather too. That stopped this week as I realized it was becoming a habit and it’s not even as though it’s that cold here, although the winds have been terrible. At least the cold weather has given you a good excuse to spend some quality time at home with your Little Man and I hope you get over your colds soon too!